The Committed package for A Better Life for Half the Price, by Tim Leffel. Includes the e-book in any format, extra reports, access to a private Facebook group, an insiders e-mail list, and access to all recorded webinars and calls. 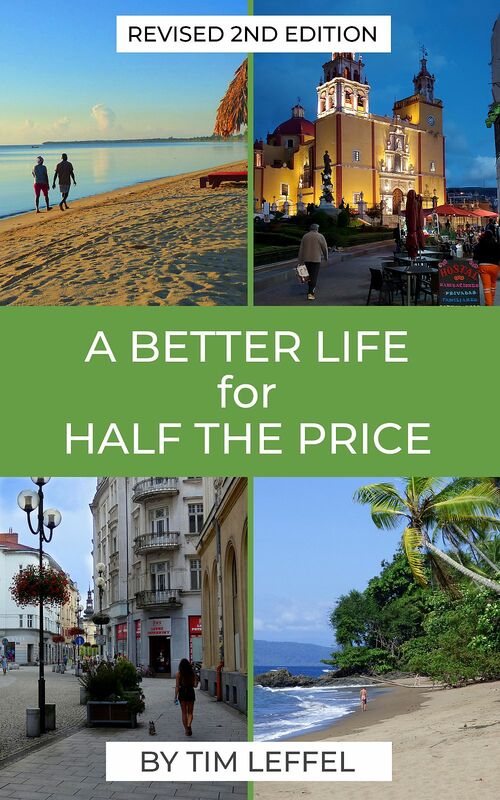 Cheap living abroadThis is a robust e-book of 300+ pages full of detailed advice, interviews with 50+ expats living the dream, and detailed pricing information for 18 of the cheapest places to live in the world. Full of resources for individual countries as well as overall resources for more info on moving abroad. You’ll have the opportunity to download the book in your favorite e-reader format if you would like. This invitation-only insiders group will only be open to the Committed and All In purchases who are serious about living a better life for half the price. You’ll be able to communicate with others planning their move abroad, talk about destinations, and get questions answered by both your peers and the book’s author. Again going out to just the Committed and All In subscribers, this will go beyond the public monthly newsletter to included visa updates, curated articles that are useful, international job resources, and new resources to check out. You will be have access to all recorded webinars, videos, and audio interviews and if you miss something when it first goes live, there will be an archive page where you can snag it anytime at your leisure.